The Beachcomber Inn is located in Pacific Grove, California at the tip of the Monterey Peninsula. We are 125 miles south of San Francisco and 75 miles southwest of San Jose. Temperatures stay between 50 and 70 degrees year-round; coastal fog brings crisp mornings and cool evenings. Our home town hosts two of the five gates to the World Famous 17-Mile Drive through Pebble Beach. We are the closest lodging to this scenic drive. Pacific Grove has much small-town charm. Picturesque Victorian homes grace the waterfront. Our town was formed as a Methodist summer retreat in 1875. Now miniature cottages, antique shops, and restaurants fill the grid of small-scale streets in the historic downtown. Deer and raccoon ramble the streets and parks. Monarch butterflies float lazily through the trees to the Monarch Grove Sanctuary. The beautiful Monarchs migrate here so faithfully each fall that locals and visitors call this place Butterfly Town. California sea otters swim right up to the shore and enjoy the thick kelp canopy which sways in the coastline waters. Birds, wild flowers, wild life, we've got it all! Our Pacific Grove Art Center boasts one of the finest galleries on the central coast. The Pacific Grove Museum of Natural History offers excellent displays of the area's natural and human history. Tri-California Events sponsor the annual Pacific Grove Triathlon. Locals and visitors love running in the hills and forest, biking around Pebble Beach, surfing in the ocean, kayaking (the Elkhorn Slough is a very nice area for this), tide pooling and scuba diving. Bird watching, wild life photography, whale watching, equestrian trails, horse shows, walking tours, garden tours, historical sites. Lots of things to do and visit. The natural surrounding nurtured the talents of Pulitzer Prize-winning author John Steinbeck (Cannery Row, Monterey and National Steinbeck Center, Salinas) who lived here during the 1930's. Pacific Grove is an easy community in which to feel at home. The people you meet on the streets are so friendly; it's like they're all breathing happy air! We have three outstanding college preparatory schools - Robert Louis Stevenson in Pebble Beach, Santa Catalina and York in Monterey. Our community college is Monterey Peninsula College. The campus of California State University Monterey Bay is in Seaside. 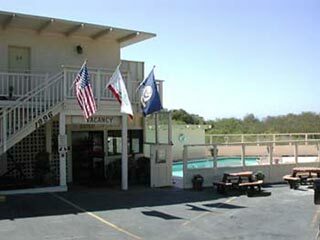 Monterey is the location of the Naval Postgraduate School, the Defense Language Institute Foreign Language Center and Monterey Institute of International Studies. In Pacific Grove is Hopkins Marine Station, a satellite marine research institute for Stanford University. In nearby Moss Landing is Moss Landing Marine Laboratories, a consortium of seven California State Universities.